Door viewers or peepholes provide people with the security that if there is anyone outside their home or office, they are able to see who it is without being seen or having to open the door. At Ironmongery Experts we understand how important security and privacy are, thus we supply a large selection of door viewers to meet your requirements. From door viewers with different designs, finishes and viewing angles, including 160 degree door peepholes, 180 degree door viewers and 200 degree peepholes. In case you require a method to have a conversation with individuals outside your home without fully opening the entrance door, door chains are ideal. This product should be paired with a main sash lock and a mortice deadlock or rim latch as a secondary security method to provide higher security to your home and family. To allow individuals outside your building to alert you of their presence, door knockers or bell push buttons should be installed. From traditional and antique-looking door knockers, such as the Shakespeare door knocker to more modern and simple bell push buttons, such as the polished chrome bell push, our wide collection of both door knockers and bell pushes should suit all tastes. 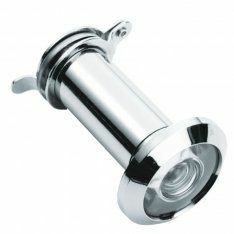 In addition to this, we supply a large range of centre door knobs and cylinder pulls to help close entrance doors from the outside when a door handle is not present. Finally, we stock a variety of letter plates to suit your needs and letter tidies to cover letter plates and help cut down on draughts over the cold months.